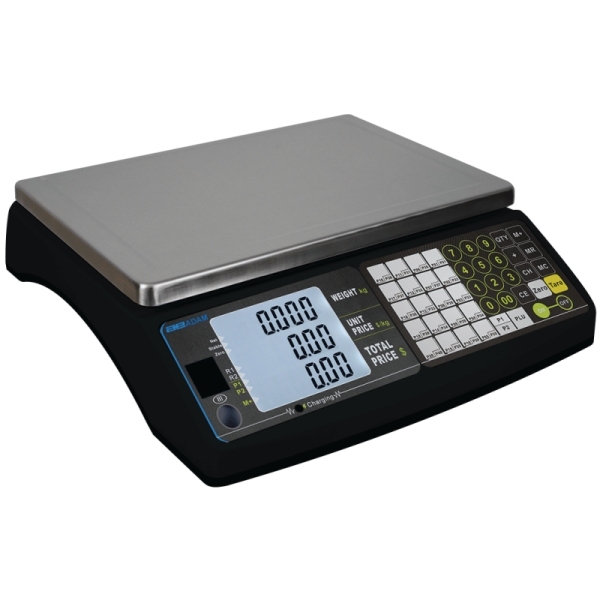 The Adam Equipment RAV 6Da Retail Price Computing Scale has a dual range capacity of 3/6 pounds with a readability of 0.001/0.002 pounds and a 8.7 x 12 inches (220 x 310mm) pan size. 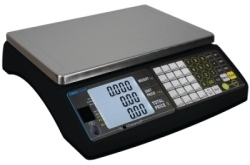 With a striking design and simple operation, the dual-range Raven scale is ideal for retail weighing and price computing. Front and rear backlit displays are visible by both operator and customer, allowing price and quantity verification. The Raven's easy-to-use keypad is sealed to keep out dirt, while its large stainless steel pan removes easily to enable quick cleaning between sales. For fast configuration and easy operation, the Raven contains 40 direct PLU keys. Suitable for use at outdoor stands or farmers' markets, the included rechargeable battery provides several days of work from a single charge. Adjustable feet can be locked to help stabilize the unit on busy countertops. The Raven is NTEP approved.